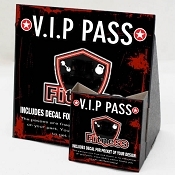 Market your gym with Sign holders and guest passes. Ad frame with brochure pocket, holds your guest passes or flyers is a great way to create more traffic to your club. Ideal for martial art studios, health and fitness clubs, chiropractor, etc.. Guest passes can offer you another way of getting new members. Place these sign holders with passes out in nearby establishment. Offer a Free 3 Day pass. This enable potential new members to try out your club without any pressure from sales. These sign holder kits comes with 25 cardboard brochure holders, custom decal stickers for the display area and pocket and 1000 custom printed take-one passes.